Vegetarian Lasagna – Packed With Veggies and Flavor!!! Lasagna is one of my all-time favorite foods. After an in-depth discussion with my sister about our lasagna techniques, I had a full blown craving going! Lasagna is a great meal to feed a larger group, so I decided to make it when my older daughter and her husband came over for dinner. My daughter is eating a pescatarian diet (mostly vegetarian, with seafood), so I decided to make a vegetarian lasagna. I used the techniques in my normal lasagna, but I left out the meat and added in layers of various vegetables. This ended up being a delicious version of this meal!!! The flavors were bold and fresh and while it was very satisfying, it was a very low-fat, healthy meal. I’ll definitely be making this version again!!! I kept this recipe as healthy as possible by making my own marinara. This way I can control exactly what goes into the sauce. Plus, I LOVE the flavor of my home made marinara! You could take this a step further and make a vegan version of this dish. There are tofu ricotta cheeses available and various non-dairy mozzarella cheeses, such as soy, that are also available. I rounded out this delicious dinner with some fresh baked dill bread. You can get this going in your bread maker 3-4 hours before dinner time. I also made a Garden Salad with Herbed Ranch Dressing. The salad and dressing can also be made up to a day ahead and tossed just prior to serving. Overall, this was a great tasting dinner and is definitely company worthy! Tip: You can boil your lasagna noodles, if you wish. Personally, I never boil my noodles and I don’t buy special no-boil noodles. If find boiled lasagna noodles to be a huge hassle. I just use the regular whole wheat lasagna noodles and I find that if you use plenty of the moist ingredients around the noodles, they cook just fine in the baking process. Start with getting your marinara made and simmering. If using jarred sauce, you don’t need to simmer it. Preheat oven to 400 degrees. Lightly spray a baking sheet with olive oil spray and lay out your zucchini and bell pepper slices. Depending on the size of your pan, you may need two. Then lightly spray your veggies with olive oil spray. 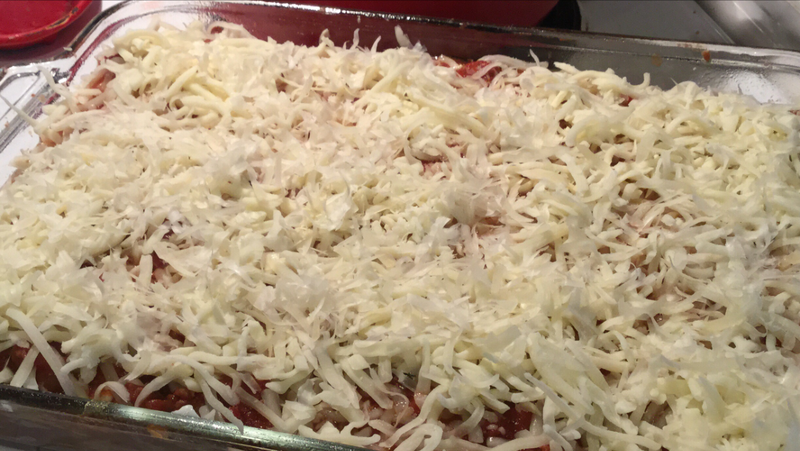 Bake in the oven for 12-15 minutes or until softened. Meanwhile, in a frying pan over medium high heat sauté onions until beginning to soften, then add mushrooms and continue to cook unto all are soft. Add spinach and sauté for a couple of minutes until cooked. After zucchini and peppers are done cooking, lower oven temperature to 375 degrees. Mix ricotta, eggs and parsley in a small bowl. Lightly spray your lasagna pan with olive oil spray. Add a thin layer of sauce to bottom of pan, enough to coat it well, then put down a single layer of uncooked lasagna noodles, spread 1/3 of your ricotta mixture, spread all of mushroom/onion mixture, spread 1/3 of mozzarella, layer 1/3 of sauce, more noodles, another 1/3 of your ricotta, spread layer of zucchini, 1/3 of mozzarella, 1/3 of sauce, pasta, last 1/3 of ricotta, layer bell pepper slices, last 1/3 of sauce, last 1/3 of mozzarella and Parmesan Cheese. Cover lasagna pan with foil and bake for 45 minutes. Remove foil and bake for an additional 15-20 minutes. Tip: Leftover lasagna freezes great! 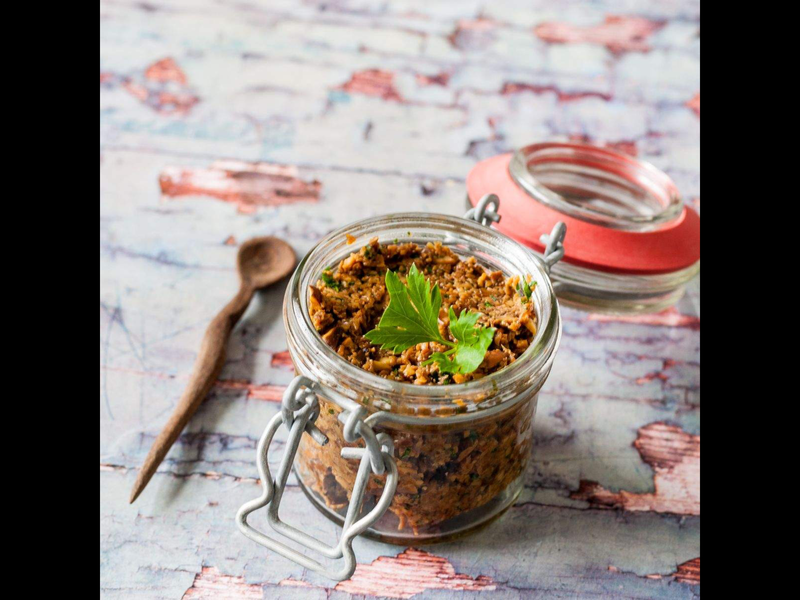 So save leftovers for a quick lunch or dinner in the future! 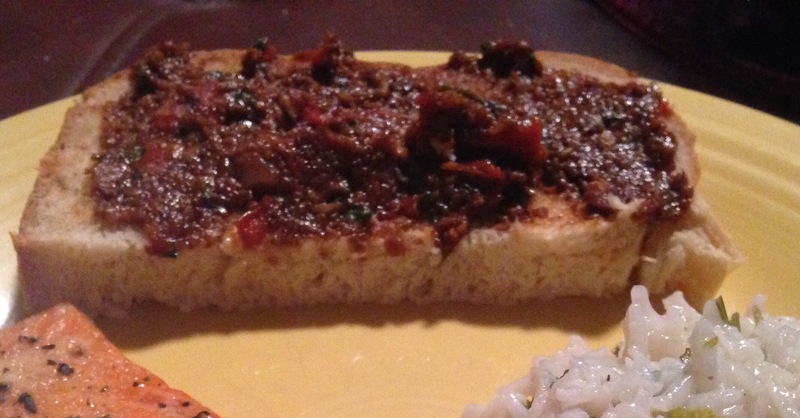 Balsamic Mushroom Spread – A Flavor Packed Topping for Bread or Appetizers! This was originally posted by another blogger, but I made it last night. It was delicious! I added 3 Sundried tomatoes to mine. The consistency reminded me of a tapenade. It made for wonderful spread on the fresh baked Hawaiian sweet bread that I made. This could be great served on little toasts as an appetizer too! I also happened to have some of my homemade garlic infused olive oil on hand, so I used that and did not add any additional garlic. The results were. Delicious!!! 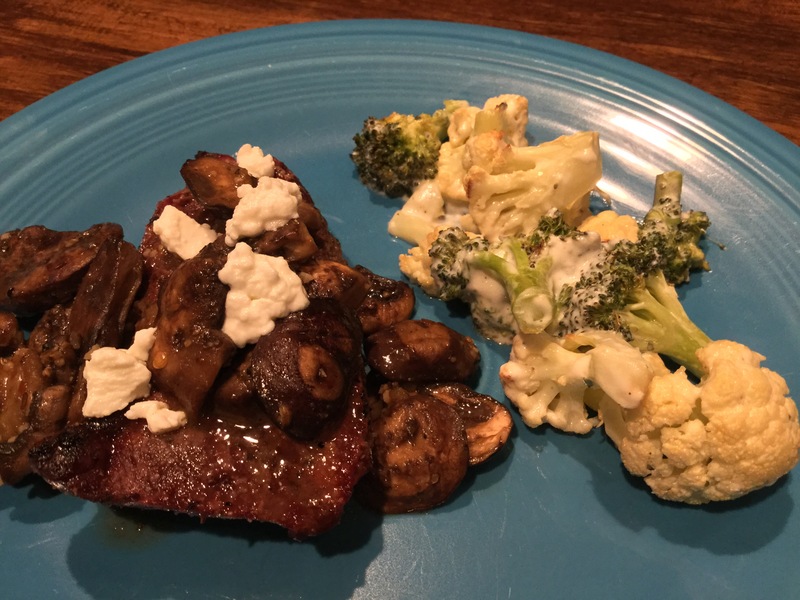 Roasted Ranch Veggies and Barbecued Steak Topped with Dijon Pepper Mushrooms – Yummm! Last night we fired up the barbecue for the first time in a long time. The minute those briquettes start burning, oh the wonderful smell!!! I had some beautiful top sirloin steaks and I also had some baby bella mushrooms on hand, so I’m thinking steaks topped with sautéed mushrooms. With a side of Roasted Ranch Veggies, we had a great meal that night! For Christmas, my niece and fellow foodie, bought me a few Sur La Table seasoning mixes. One of these was a Dijon Pepper Vinaigrette mushroom seasoning mix. It was intended for the large, whole portabellas, so I deviated from the recipe on the package. I sautéed my sliced baby bella mushrooms in a little olive oil then added about a tablespoon and half of the seasoning mix and a ¼ cup of white wine. Yummm! These were the perfect topping to our steaks, that and a little bit of crumbled goat cheese that I had left over from a previous meal. Since the mushrooms were pretty flavorful, I wanted to keep the seasoning on the steaks a little on the lighter side. My usual barbecue rub is pretty bold, so I bypassed that and seasoned them with a little Garlic Pappy’s. Pappy’s seasonings are great to keep on hand! I love their flavors! I had some cauliflower and broccoli that needed to be cooked, so I decided to roast that up. And since I was in seasoning packet mode, I thought I’d use a little ranch dressing mix to jazz up my veggies. They turned out great! Preheat oven to 400 degrees. Spray a baking sheet with non-stick spray. Cut veggies into bite size pieces. Spray veggies with non-stick spray and toss to lightly coat, spraying more if needed. Bake for 10 minutes, stir, bake an additional 10 minutes. In an oven safe larger bowl or pan, mix ranch dressing mix and sour cream. Add roasted veggies and toss to coat, return to oven for about 5 minutes or until warmed up. The dressing will cool it down a bit and I wanted to warm it back up. 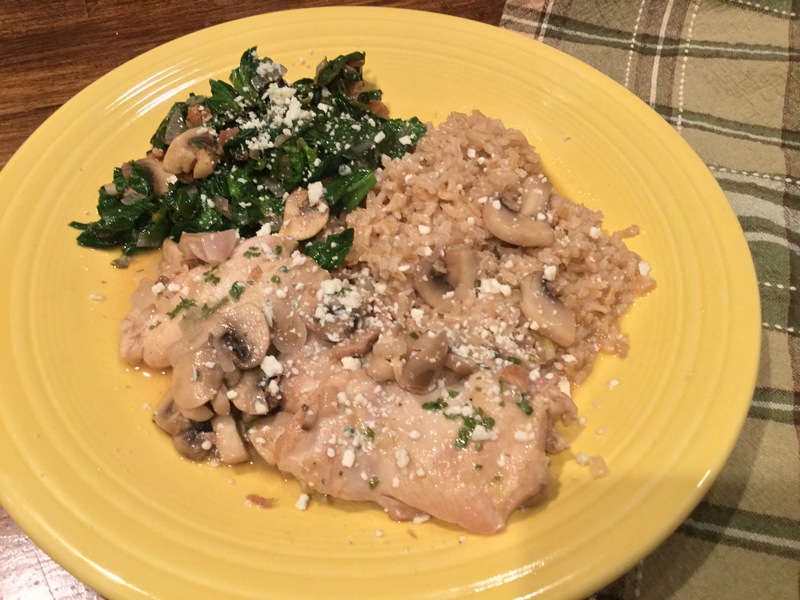 Chicken Marsala with Gorgonzola Cheese – One of my Favorite Chicken Dishes Made Light! Chicken Marsala is made with, you guessed it, Marsala wine! Marsala wine is a fortified wine originating from Scicily. It has a very distinct flavor. I don’t know that I would want to use it for drinking, but I love the savory flavor that it adds to this dish. I also love mushrooms and Gorgonzola cheese, so this dish is just an all round win for me! In my version, I have eliminated the butter that is usually in the recipe in an effort to lower the fat content. I do have to admit that I used an inexpensive type of Marsala primarily intended for cooking. One of these days, I’m going to have to visit BevMo and invest in a more expensive, authentic Marsala and see how that tastes. I’m sure it will be wonderful! This dish does have a nice amount of sauce, so it is well served over rice. I chose to serve it over brown rice, as I was trying to keep it healthy. I think it would also be great over a basic risotto. I also served a wonderful serve a sautéed spinach with bacon, shallot and mushrooms. I’ll post this recipe tomorrow. It was also really good! Add olive oil to frying pan, if additional oil is needed use spray olive oil to coat pan. Heat over medium high heat. Cook chicken until browned on both sides about 3-4 minutes per side. Remove to a plate. It’s OK if it’s still pink in the middle, as it will cook more later. If needed, add additional olive oil to pan. Add mushrooms and sauté until starting to brown. Add shallots and cook until tender. Sprinkle flour over vegetables and stir. Add some salt and pepper. Pour wine into pan and stir, scraping bit off bottom of pan. Cook until thickened. Add chicken broth and continue to cook stirring occasionally. When it has reduced and thickened some, add the chicken back into the pan. Reduce heat to low and simmer for about 15-20 minutes or until chicken is cooked through. Prior to serving, sprinkle with parsley and Gorgonzola cheese. Serve over rice. I first fell in love with French cooking when I was in high school and made Coq Au Vin for a French club potluck. The savory red wine sauce, laced with bacon over fall-apart tender chicken and sweet carrots is a refined dinner that is elegant enough for company, but easy enough for any family dinner night. 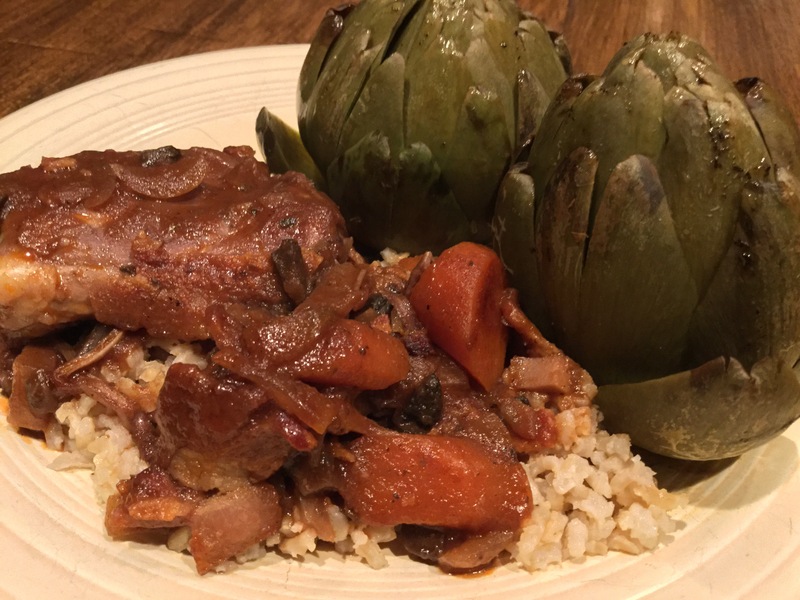 I chose to serve mine over brown rice with a side of organic artichokes that I couldn’t resist drizzling with a little of the bacon fat. Not a healthy choice I know, but it’s not often I cook with bacon, so I couldn’t resist and it was totally worth it! This meal was basically one of those where I threw everything into one pot, let simmer and relaxed for a while. I love those kind of meals! Cook a little, relax a little and voila! So without further delay…. I used my Dutch oven on the stove top. You could also use your slow cooker, but cook longer. Pour wine in your pot. Then add chicken broth and tomato paste. Whisk lightly to break up the tomato paste and mix with other liquids. Add remaining ingredients, except for bacon. Simmer over medium low heat, covered for 1 hour. Tilt the lid on your pot to vent and cook another 30 minutes. Increase he heat a little if needed to maintain the low simmer. This dish is very saucy and is very nice served over rice. 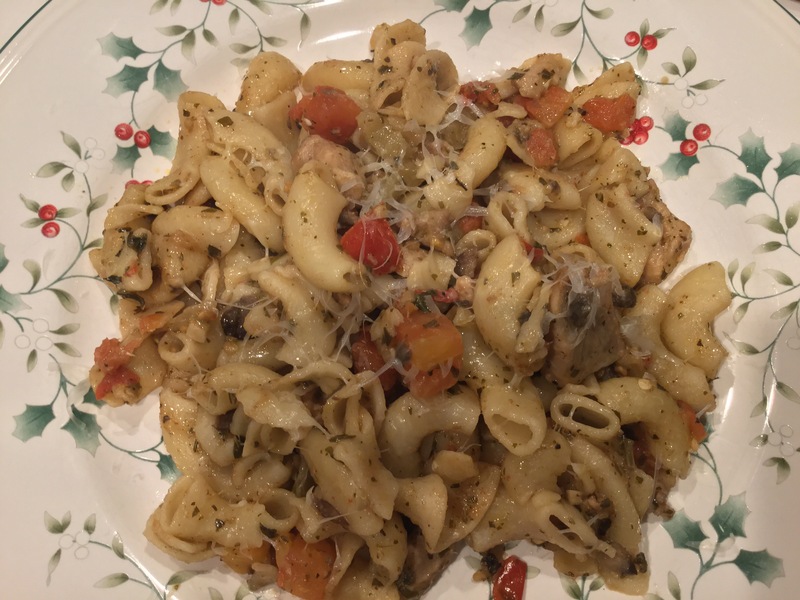 Chicken Eggplant Pasta – The Trick to Perfect Eggplant! As I’ve mentioned in previous posts, I take great pride in getting others to eat healthy without realizing that’s what they’re doing! One of my favorite ingredients to sneak by people is eggplant. So many people have eaten slimy eggplant at the hands of someone who didn’t know the secret to cooking it properly. So what’s the secret??? You have to drain that stuff!!! Eggplant is an odd vegetable. It can get slimy. Yuck!!! And it can get tough if over cooked. My trick to avoid slimy eggplant is to drain it well. Whether you’re slicing it for dishes like eggplant Parmesan or chopping it for the dish I made here, you can drain it the same way. You want to peel and slice or dice your eggplant and then layer it in a colander, making sure to salt each layer. You want to make sure as much of the eggplant as possible gets salted. Then you need to weight it down to press the water out. I put a small, salad sized plate over the top of the eggplant in the colander and then put something heavy on top of the plate. I then just set the whole thing in the sink and let it sit for about an hour. As time goes by, you can feel the water draining frrom the bottom of the colander. Now when you proceed to cook whatever dish you’re making don’t forget all the salt you’ve already incorporated. You want to tread lightly with any additional salt, so you don’t over salt your dish. Note: This could also be a tasty vegan dish by just leaving out the chicken. Add olive oil to large sauté or frying pan. Add chicken and cook until chicken starts to cook on all sides. Add eggplant and cook another 3-4 minutes until eggplant begins to soften. Add mushrooms, tomatoes, basil, wine, vinegar, pesto and garlic and cook a few more minutes until mushrooms soften. After chicken is cooked all the way through add salt and pepper to taste. Remember to easy with the salt as you already salted the eggplant. Toss your chicken and veggies with pasta and serve.